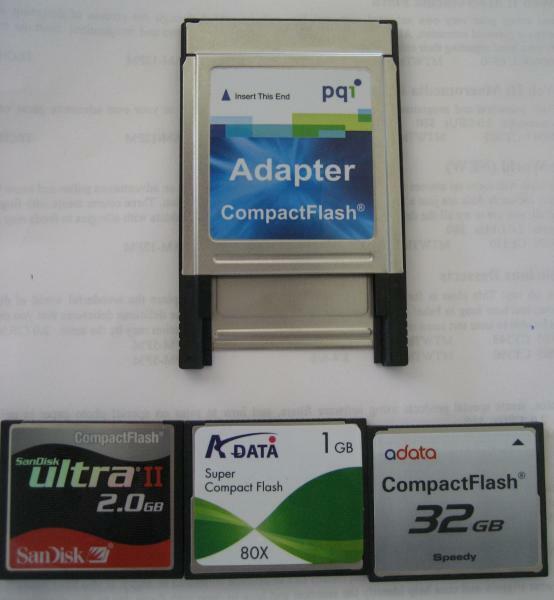 Hi Guys I would like to get help from you what you use for your PCMCIA slot and what particular Memory & adapter do you use particulary the size and BRAND. I like to make a list here on the brands that the command would accept. I believe some PCMCIA card readers are not compatible and that some CF memories does not work. plus all SD/SDHC cards I've tossed in there. There is no card name or brand that I can find on this adaptor but I got it from ebay so stay away from this one. It looks like the key is the PCMCIA adapter. Before the SANDISK, I trien a COMPUSA brand adapter. Did not work on either memory card I tried. I agree but problem is SANDISK adapter is hard to find. If you search for it only, the pictures you'll see are probably of the old version (same model number - thanks sandisk....) without SDHC support. However from those I've talked to who have ordered them online are getting the new versions with SDHC support. You can tell by looking closely at the picture on the front of the card. 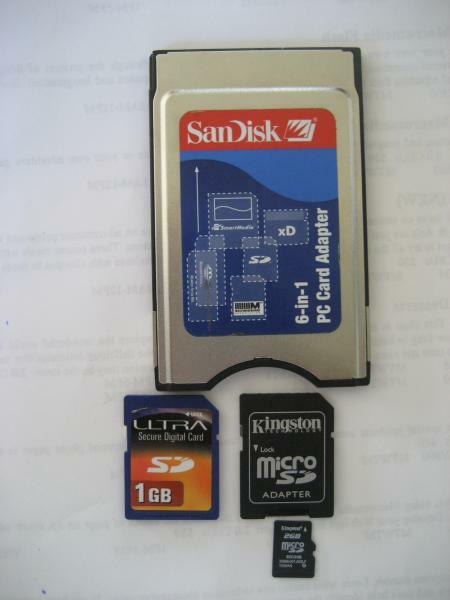 It shows BOTH the SD & the SDHC logos in the outline of the SD card. I purchased mine from BestBuy to make sure I got the correct one. I haven't seen it sold on their website though, just in the store. At least here in MN. I'm not from USA but I did went there to look for that particular sandisk adapter at best buy and other stores but no luck even in Hong Kong they don't have it. I read somewhere that production to this adapter was very limited so it would not be so easy to find one. it use to be $59.99 but they put it on sale for $14.99 CDN! It also supports SDHC! good luck! is it possible to find this card on EBAY ? pcmcia questions. I just got a 2007 s600. I can buy an ipod dcok or just use the slot. 1. Is the 8gb unit above the biggest capacity you can get? 2. What does adapter suggest? Do I need an adapter plus something else? 3. I have my music on itunes. How do i get it onto the pcmcia card? 4. is it convenient to use once you make it work? 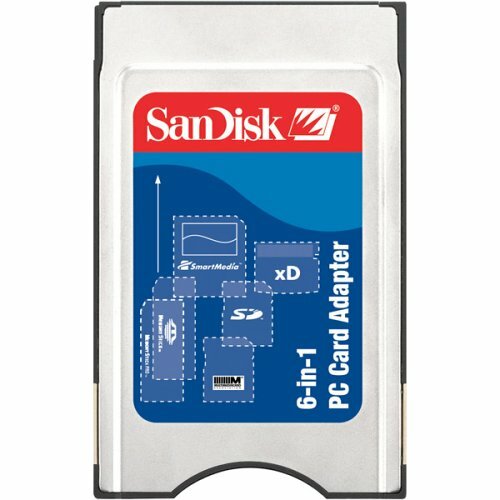 SO HOW DO I HOOK THE PCMCIA CARD UP TO MY COMPUTER. I HAVE USB PORTS AND A DVD. Or, you could just use the iPod and ignore the whole thing. I can confirm the following combination seems to work. Ok I have been in to bestbuy(I live in Washington State). they don't have the PCMCIA adapter for media cards. I was disappointed and almost gave up using PCMCIA. Then, I had reason to stop by at Fred Meyers and went to electronic section or card reader isle. then, I saw something looks like PCMCIA, and there it was. It was Jobo 6 in 1 PCMCIA(ultra speed). on the card reader, it had SD logo and also SDHC logo, and many others. I checked with SD and it works great. Now, I am going to get large SDHC and use it for my audio needs. I do have ipod option from dealer, and I will be using this as my iphone 3g charger(needed to purchase little thing in order to charge the 3g on ipod connector). So if try to look for jobo product. I will post picture if needed, later. did you have to order it online on henrys.ca or did you go to the store and buy it?